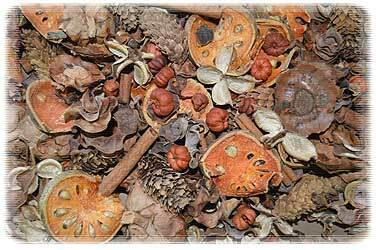 Celebrate fall with our spicy Pumpkin Harvest Potpourri. The one-pound size of this blend is now specially priced at 15% off, for a limited time. Scent of the Day: Several times a week we put one of our fragrance blends on special as our Scent of the Day. Our current Scent of the Day is our Cranberries & Cream fragrance oil blend, 25% off/oz. Other news: Enter to win in our September Potpourri Giveaway! This month we're giving away a pound of our Pumpkin Harvest Potpourri blend (yeah, it's all about the pumpkin here lately). You can enter a number of ways every day here.